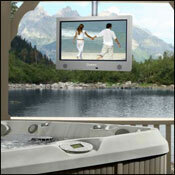 SunBriteTV 23'' Outdoor LCD TV : includes Outdoor Dust Cover! Finally you can enjoy your favorite movie, watch the big game or play your video games in high definition in the comfort of your own backyard regardless of the weather. Be it sun, rain, snow or cold; the Sunbrite 23” Outdoor LCD TV has an aluminum enclosure that protects it from any and all of the elements. Ideal for entertaining, this outdoor TV is the perfect compliment to your outdoor living area and is sure to be the envy of all your guests. While some televisions lose picture quality due to glare, the 800 nits screen on our outdoor TV allows for flawless viewing even in shaded daylight. 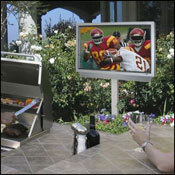 Go ahead and enjoy the outdoors without missing a season finale or your favorite sporting event! Conformal coating protects the internal electronics from humidity-related corrosion damage. An innovative water tight cable entry system allows the use of standard AV cable. The passthrough design makes hook-up quick and easy. Please keep original box for warranty purposes. TV must be shipped in original box for warranty to be valid. If lost, up to customer to purchase box from manufacturer. 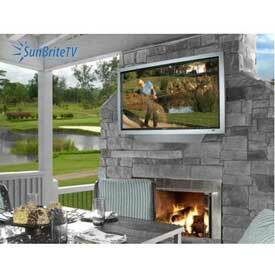 SunBriteTV 32'' Outdoor HD LCD TV : includes Articulating Wall Mount and Outdoor Dust Cover! Nothing looks better than a great movie or sporting event in high definition and nothing feels better than being able to relax and unwind in the comfort of your own backyard with a weatherproof tv. 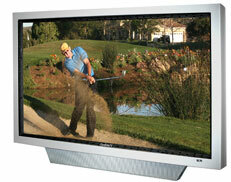 With the Sunbrite 32” Outdoor HD LCD TV, you can enjoy both, in any kind of weather. This weatherproof TV has an all-weather aluminum enclosure that protects it against the many turmoils of Mother Nature, and the 800 nits screen allows for perfect viewing of this outdoor television in shaded sunlight. 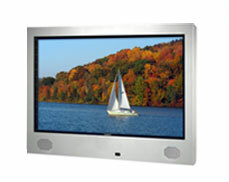 Ideal for entertaining, this weatherproof TV will be the envy of all of your guests, and the talk of the neighborhood. Dual airflow system keeps unit cool and dry in temperatures up to 122 degrees F.
Dual-Arm articulating wall mount for 46” LCD TV. 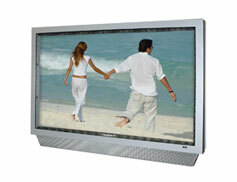 Extends to 21”, customized to fit SunBriteTV 46” series. Single-arm articulating wall mount for 32” LCD TV. Single-arm articulating wall mount for 23” LCD TV. increments without disassembly and 8” x 8” ceiling plate. Customized to fit. Includes stainless steel hardware. purchase of Wall Mount SB-WM46 or SB-WM46NA). flange is 12” W x 12” D. Includes stainless steel hardware. accommodates SunBriteTV’s Articulating Wall Mount SBWM32.